there's a company that doesn't believe that recycling water bottles, whether we make lamps out of them or put them in recycling bins, is the answer for the future. 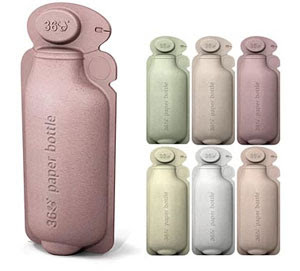 So this international design company, Brandimage, has invented the 360 Paper Water Bottle. Now all the earth needs are water bottling companies ready and willing to use the technology. Instead of responding to a client's desire to create a more ecological image, Brandimage created the 360 Paper Water Bottle as a response to what is happening to the environment and in the bottling industry. In this a novel approach to design, Brandimage is taking the responsibility for ecological design and innovation in an attempt to induce clients to utilize it. The homework is done; now Brandimage is offering water bottling companies the opportunity to positively brand their images by using these bottles that are 100 percent sustainable. Brandimage's first "visionary deliverable" is the 360 Paper Water Bottle, and you might say it's pretty cool. The 360 Paper Water Bottle utilizes sustainable sheet stock made of bamboo, palm leaves, and other natural plants which is pressed into 2 halves to encapsulate a micro-thin PLA film that provides liquid/O2 barrier. PLA stands for poly-lactic acid, which is highly degradable. The bottle top, which incorporates a sanitary plug to reseal the bottle, is torn off at the top. Once the plug is removed the torn paper stays tethered to the bottle to eliminate litter. Because the bottles are die-stamped together the six-pack formation does not require a separate six-pack carrier for the bottles. Natural dyes are used to color the bottles and company graphics may be embossed into the paper or applied with labels. If embossing is chosen, fewer materials and labor will be needed. Natural structural board creates the shipping containers, reducing the material used in palletizing the water bottles, ...and the paper board tag, which may be snapped off, provides space for marketing copy. Brandimage has researched its design thoroughly from every perspective -- from manufacturing to bottling to delivery and point of purchase. It calls the Paper Bottle "360" because Brandimage has created its product from every perspective. Fabulous idea, don't you think? Wonder which companies will be the first to utilize this brilliant ecological design and lift the huge footprint made by plastic waste in our world.